Every year, over 80,000 students apply for admission into one course or the other in the Imo State University Owerri, it will shock you to know that only about 3000-4000 of those students eventually get admitted. For aspirants who hail from Imo State, you should know by now that the Imo State government will offer you free education if you get admitted into the institution. For non-indigenes of the state, IMSU is one of the state universities I will recommend because their fees is not as exorbitant as obtainable in other state owned universities in the country. The school was formerly ranked the best State University in the country and the 10th amongst state and federal universities. To get admitted into the Imo State University an aspirant needs to 1. Choose the school as first choice in Jamb. 2. Work hard and score above 180 in Jamb, 3. Score above the required cut-off mark in the post-utme exercise conducted by the school. And finally ensure that he/she has the required O’level credits to study his/her course of choice. The Imo State University also conducts a computer based post-utme examination (CBT) for aspirants. 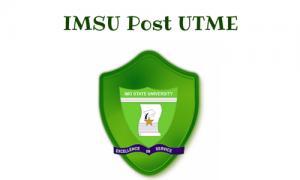 IMSU post-utme application form goes for only N4000 and is sold on some designated banks in and around Imo state as specified by the school each year. The good thing about this payment is that it covers for registration, screening, result checking and portal charges. Below is a list of courses offered in IMSU, their O’level requirements and Jamb subject combination. History and International Studies English language, literature in English, government and any other 2 social science subject Literature, government and any other social science subject. Foundation and Counseling English, maths, Literature in English, government and any other social science or arts subject. Government, literature in English and any other social science subject.